This article is about Ontology (ONT) Staking. Find out more here. Ontology staking round 1 started in mid Oct 2018. As an experiment, I staked 500 ONT on Dubhe node from Round 1 (mid Oct) till end Oct. One component of the staking returns is distributed monthly and the first distribution came in on 1st Nov 2018. The staking ROI was therefore unknown until now. I’m using 1 stake (500 ONT) on Dubhe node. I started staking from Round 1 till present. At pixel time, ONT is worth USD 1.65 and ONG worth USD 0.88. That is, my stake is worth 825 USD. What are the components of the staking returns? 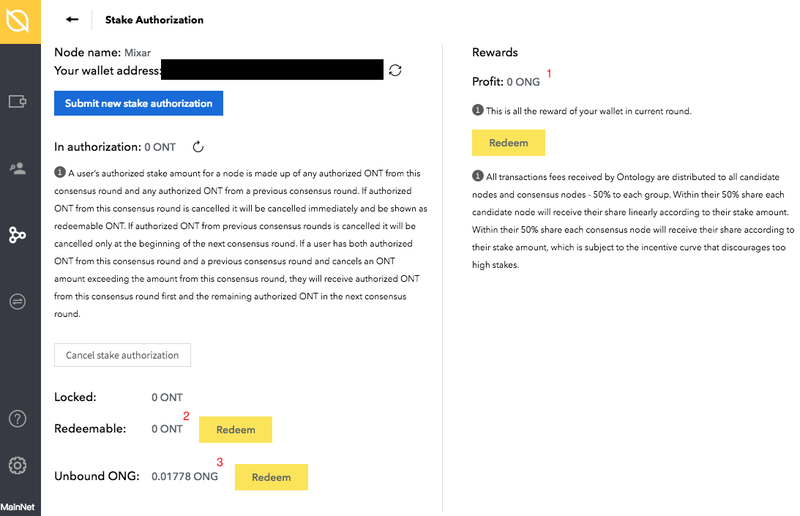 [c] And for the first 3 years, additional ONG from the Ontology Foundation Bonus. This gives a annual ROI of 25.63*12/825 = 0.373 or 37.3%! Not a bad deal compared to hodling ONT(8%), NEO (3%), or BIX (15.6%). This means that the ONG Foundation Bonus [c] forms the bulk of the ROI so be sure not to miss it! This component alone gave 21.4% ROI (more than half of the total ROI). Also, even though returns from fees [b] is currently minuscule, this is the only component that scales with the usage of the Ontology network and is so more “future-proof”. As the Ontology network grows, we can expect [b] to increase as well. If you believe in Ontology’s future, this is the component to watch! In contrast, components [a] and [c] scales based on your stake amount, and [c] even has a end date. The returns of course depends on the node. Not all nodes are equal. In general, you’d want to choose the node that has higher reward proportion (so that the pizza is bigger) and lower current total stake (so that each slice is bigger). If you have 2 or more stakes, telegram community members have recommended splitting them between different nodes to average out the returns. The node I used (Dubhe) is currently suggested by the Telegram community to provide the lowest returns out of the nodes. Your mileage may vary. Interest in staking? Read more on how to start here! Warning: Returns fluctuate, and it would have changed since this article was published. In fact, since then, a lot of people started staking and returns have fallen. Please take note if you do start staking! You may want to check out BIX staking too. ^ Note (This part credited to @andreidita): The 10,000,000 ONG is to be equally distributed to the running nodes in monthly batches. This means a fund of 833,333 ONG per month that will be split to the nodes running in that month. All nodes will receive the same fixed monthly bonus reward. Currently there are 33 running nodes which means 25.525 ONG as bonus reward to each node as confirmed by official past data for august which can be found here. Since all 7 nodes currently give 100% of reward to users, the bonus reward earned by 1 stake is computed by dividing node bonus reward (25k ONG with 33 nodes) to the number of active stakes made to that node. Therefore, the earnings for 1 stake in a given node (assuming all share 100%) will be inversely proportional with the number of stakes made to that node. The less stakes in a node, the more each stake will get as monthly bonus. Where will I receive the staking rewards? For the ONG Foundation Bonus [c], it will be sent directly to your wallet. For the other 2 components [a] + [b], it will be in the Stake Authorisation screen, in the screen after selecting a node. You will need to click on Redeem. Below: : current round rewards. : past round rewards. : ONG generation rewards. How is the ONG Foundation Bonus calculated? From my email with the Ontology team, this is calculated/sent manually by the Ontology Foundation. What time does the calendar month rollover? The Ontology team did not specify in my query email, but based on the fact that this is calculated manually, I assume it rolls over at midnight UTC+8 (China’s timezone, where Ontology is based). Need a wallet to keep ONT? Check out hardware wallets that supports ONT and ONG. When does the next round start? Check this telegram bot.